Here is best "KARAIKUDI KAALAI VS MADURAI PANTHERS", 24th Match,Tamil Nadu Premier League 2018, Dream11Predictions for the Fantasy user ,who venue are looking to make a strong team for maximum win. We are providing latest news, match update, information about the match .The team is picked by using various factors on the basis of performance, ground stats and latest form. 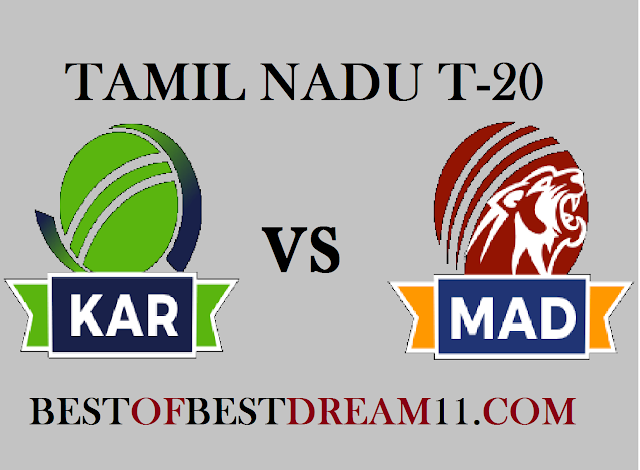 "The Karaikudi Kaalai running in the first place on the points table,will be fought Madurai Panthers in the evening today.Both the teams have so far played 5 matches,out of which 4 have won. After losing the first match ,both teams have won four consecutive matches so far. 1-for Karaikudi Kaalai, captain S Anirudha is in a formidable form, he has scored 233 runs(93*+56+41+43) in the last four innings. 2-M Shajahan and V Aditya are also contributed for their team. 3-in bowling ,A Mukumtham took 5 wicket in the last match while Yo Mahesh, S Prasath and R Rajkumar are the crucial bowler. 4-For MAD,Thalaivan Sargunam has blasted 2 fifties in the last two matches. 6- Abhishek Tanwar, Varun Chakravarthi and Ravi Shah will be also very crucial for their team. V Aditya, Srikkanth Anirudha(c), Maan Bafna, L Suryaprakash, Rajhamany Srinivasan, M Shajahan, R Kavin(w), Yo Mahesh, R Rajkumar, S Kishan Kumar, S Mohan Prasath, P Murgesh, T Ajith Kumar, S Swaminathan, Ashwath Mukumthan, S Radhakrishnan, Velidi Lakshman, S Ganesh.